Assessing the skill of the Atlantic meridional overturning circulation (AMOC) in decadal hindcasts (i.e. retrospective predictions) is hampered by a lack of observations for verification. Models are therefore needed to reconstruct the historical AMOC variability. Here we show that ten recent oceanic syntheses provide a common signal of AMOC variability at 45°N, with an increase from the 1960s to the mid-1990s and a decrease thereafter although they disagree on the exact magnitude. This signal correlates with observed key processes such as the North Atlantic Oscillation, sub-polar gyre strength, Atlantic sea surface temperature dipole, and Labrador Sea convection that are thought to be related to the AMOC. Furthermore, we find potential predictability of the mid-latitude AMOC for the first 3–6 year means when we validate decadal hindcasts for the past 50 years against the multi-model signal. However, this predictability is not found in models driven only by external radiative changes, demonstrating the need for initialization of decadal climate predictions. This work was supported by the joint DECC/Defra Met Office Hadley Centre Climate Programme (GA01101), EU-ENSEMBLES, EU-THOR and German Ministry for Education and Research (BMBF)-The North Atlantic as Part of the Earth System: From System Comprehension to Analysis of Regional Impacts projects. We thank two anonymous reviewers for their valuable comments which helped to improved the paper, M. McVean at ECMWF for carrying out the DePreSys PPE experiments, E. da Costa for performing the CERFACS experiments, and S. Cusack for performing the Had simulations. Observational time series of layer thickness for LS water courtesy of D. Kieke, IUP, Universität Bremen, Germany; NAO index of J. Hurrell, NCAR, CO, USA (http://www.cgd.ucar.edu/cas/jhurrell/indices.html), and altimeter products were produced and distributed by Aviso (http://www.aviso.oceanobs.com), as part of the Ssalto ground processing segment. The Atlantic dipole SST index is calculated from HadISST data (Rayner et al. 2003) (http://www.metoffice.gov.uk/hadobs/hadisst/). The Met Office Decadal Prediction System (DePreSys) (Smith et al. 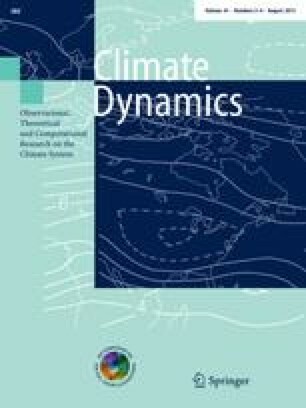 2007) is based on the third Hadley Centre climate model (HadCM3) (Gordon et al. 2000), with a resolution of 2.5° × 3.75° in the atmosphere and 1.25° in the ocean. The assimilation experiment is performed by integrating HadCM3 relaxing oceanic temperature and salinity (T, S), and atmospheric horizontal winds (u, v), temperature and surface pressure (p*), to analyses of observations. The atmospheric analyses are taken from the European Centre for Medium-Range Weather Forecasts (ECMWF) reanalysis (ERA40 (Uppala et al. 2005) and operational analysis from 2002 onwards). The ocean analyses are created by four-dimensional, multivariate optimal interpolation (Smith and Murphy 2007) of salinity and sub-surface temperature observations and analyzed sea surface temperature (SST) from HadSST2 (Rayner et al. 2006) and HadISST (Rayner et al. 2003), using covariances from HadCM3. The ocean analyses are full-depth, but will be close to climatology in the deeper ocean where data are particularly sparse. The lack of deeper North Atlantic ocean observational data might introduce uncertainties in the AMOC analyses. DePreSys hindcasts consist of 10 ensemble members starting on November 1st every 5 years from 1960 to 2005 inclusive (10 start dates). DePreSys perturbed physics ensemble (PPE) (Smith et al. 2010) is an updated version of DePreSys that additionally samples modelling uncertainty. This is achieved with a nine-member ensemble of “perturbed physics” HadCM3 model variants, sampling model uncertainties through perturbations of poorly constrained atmospheric and surface variables. These perturbations were applied to a configuration of HadCM3 updated to include a fully interactive representation of the sulphur cycle, and flux adjustments (calculated separately for each model variant) to restrict the development of regional biases in sea surface temperature and salinity (Collins et al. 2006a, 2010). DePreSys PPE hindcasts consist of nine ensemble members (one with each model variant) starting on November 1st in each year from 1960 to 2005 (46 start dates). Had is an ocean analysis created using the Met Office seasonal forecasting system, GloSea (Graham et al. 2005) but based on HadGEM2 (Collins et al. 2008). The analyses contain 3 ensemble members, obtained by perturbing the atmospheric wind forcing. Hindcasts were not available with this system. The MPI (Pohlmann et al. 2009; Kröger et al. 2012) system uses the European Centre-Hamburg model version 5–Max Planck Institute Ocean Model (ECHAM5–MPI-OM) (Jungclaus et al. 2006) climate model with a resolution of T63 L31 in the atmosphere and 1.5° × 1.5° L40 in the ocean. At low resolution (MPI coarse) the model is run with T31 L19 in the atmosphere and 3° × 3° in the ocean. An assimilation run is performed by relaxing monthly-mean temperature (T) and salinity (S) of the ocean component of the coupled model toward the anomalies from the German contribution to Estimating the Circulation and Climate (GECCO) (Köhl et al. 2007) synthesis. The GECCO framework uses the adjoint to the Massachusetts Institute of Technology (MIT) ocean model (Marshall et al. 1997) to bring the model into consistency with available hydrographic and satellite data, as well as with prior estimates of surface fluxes of momentum, heat, and freshwater. MPI hindcasts consist of one ensemble member starting on January 1st each year from 1952 to 2001 (50 start dates). MPI coarse hindcasts consist of one ensemble member starting each year from 1960 to 2001 (42 start dates). The MPI NCEP (Matei et al. 2012b) system uses the same ocean model as in the MPI coupled system to perform an ensemble of four NCEP forced integrations for the period 1948–2007. In these experiments, the MPI-OM ocean model is forced with daily fluxes of momentum, heat and fresh-water taken from the NCEP-NCAR reanalysis (Kalnay et al. 1996) fields. The daily heat flux is not taken directly from the NCEP-NCAR reanalysis, but computed using a bulk formula. The ensemble mean 3D fields of temperature and salinity anomalies are then nudged into the coupled model to provide initial conditions for the hindcast experiments, which consist of one ensemble member starting January 1st each year from 1949 to 2008 (60 start dates) and an additional two ensemble members starting every 5 years from 1950 to 2005 (12 start dates). The ECMWF forecast system (Anderson et al. 2007) used the IFS atmosphere model with a horizontal truncation of T95 and 40 vertical levels. The HOPE ocean model has a horizontal resolution of 1°, with an equatorial refinement of 0.3°, and 29 levels in the vertical. The ocean assimilation system for ORA_S3 (Balmaseda et al. 2008) is based on the HOPE optimal interpolation scheme, which allows for assimilation of subsurface temperature and also altimeter derived sea-level anomalies and salinity data. The five simultaneous ocean syntheses are created by adding perturbations, commensurate with the estimated uncertainty, to the wind stress. Atmospheric and land surface initial conditions come from ERA40 (Uppala et al. 2005), or the operational ECMWF analysis for start dates after August 2001. ECMWF hindcasts consist of 3 ensemble members starting on November 1st every 5 years from 1960 to 2005 inclusive (10 start dates). The CERFACS forecast system (Daget et al. 2009) consists of the ARPEGE4.6 atmosphere and OPA8.2 ocean model. The atmospheric grid is of T63 and the ocean grid is of 2° × 2° L31 resolution. A 3-dimensional variational assimilation scheme (Weaver et al. 2005) is used to produce oceanic synthesis. An ensemble of 9 ocean syntheses is produced by perturbing the wind and SST fields. However, only 3 are used to initialize the hindcasts on November 1st every 5 years from 1960 to 2005 (10 start dates). The CMCC-INGV system uses the ECHAM5 atmosphere model and the OPA8.2 ocean model. The atmospheric resolution is T63/L19 and that of the ocean 2° × 2° L31. A reduced order optimal interpolation assimilation scheme (Bellucci et al. 2007) is used to produce the ocean syntheses. An ensemble of 3 ocean syntheses is produced by perturbing the wind and SST fields. Hindcasts were not available with this system. The IFM-GEOMAR (Keenlyside et al. 2008) system uses the ECHAM5/MPI-OM (Jungclaus et al. 2006) coupled general circulation model. A resolution of T63 L31 is used in the atmospheric and 1.5° × 1.5° L40 in the oceanic model component. Three coupled integrations using SST-restoration are produced from 1950 to 2005. Hindcasts are started from each of the 3 reanalyses on November 1st every 5 years from 1955 to 2005 inclusive (11 start dates).